Under UK law copywrite material sent over the Internet or stored on web servers is protected in the same way as material in other media. copywrite will be enforced under the legal framework of the countries where infringement occurs. This apply's to using or publishing the material including the title, on this official site. The Official Mothers Against Knives web site. Click here. The ban came into force April 2008, replica Samurai swords were added to the banned list. The government has also expressed they will review other weapons that serve no purpose in our society in due course. 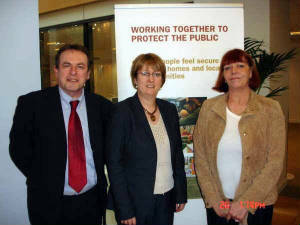 I met the Home Secretary last year to discuss the ban and knife crime, and also the work we do. I also thanked her and minister's for bringing the ban into force. I would like to thank everyone who has signed the petition your signitures went to Downing street when I handed the petition to ministers. Mothers against knives is a continuation of what Barbara started in 2003, Mothers against knives was founded in July 2005 by two Middlesbrough Mothers, Barbara Lesley Dunne & Councillor Joan McTigue. This campaign has the full backing of many Chief Constables and MP`s from all over the U.K. The Rt. Hon. Hazel Blears M.P. 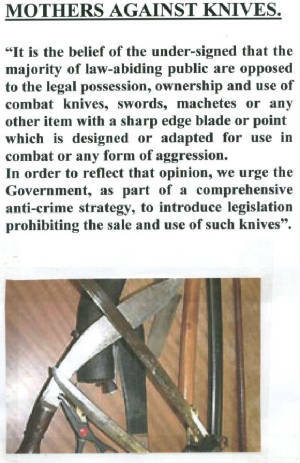 has proposed a blanket ban on samuria swords from being sold in the High Street, car boot sales and the Internet. However ,the campaign is to have some form of legislation to either ban or restrict severly the sale of bladed weapons e.g. machettes, combat knives ect. Figures out recently show that the crime rate involving knives is at an all time high, far higher than gun crime ! I urge anyone reading this page, whether they are a parent or not, to join me in trying to make this country of ours a safer place for all. As stated on the mothers against knives page 2 with the news clipping( if you click Barbara's story the page is on that site). I have been asked by a minister of state at the home office that any comments or suggestions are welcome from me on what weapons to ban. This what I have done I have compiled 12 catagory's with 10 weapons to each catagory that should not be for sale, for their perusal. Looking at the banned list which I have none of those that I have sent are on it and should be. I advised them as a anti-crime strategy to class adding to the list as urgent. I am now waiting for feed back. I will give them time, then I will write to the minister responsible for the policy to ask what has been proposed. Please sign my petition, would you state full name and area for your signiture to count. Link to sign is below. This site is for Robert Dunne who was murdered in a horrific way, published by his mother for him. The signitures on this site are from people who have followed the story and progress of our campaign for 6 years. This site and Inspires dedication site, we pay for them, thats why I say owned in the disclaimer. If you would like to leave a kind word it would be welcomed and appreciated, thankyou. The campaign was started in 2003 after the tragic death of Robert Dunne, Barbara,s son who was stabbed in the back with a samuria sword and bled to death in the street, Barbara tirelessly campaigned and then joined forces with councilor Joan McTigue, and the mothers against knives campaign was founded. The full story of Barbara can be read on the link below, please be sure to read the page a mothers fight against knives. The campaigning mum of a Teesside stabbing victim has been offered the chance to make history. Whinney Banks gran Barbara Dunne, was stunned when Home Office chiefs sent her a letter asking for her to help them put together a new banned weapons list. The list will be incorporated into the Criminal Justice Act. 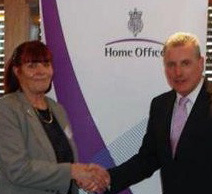 Mrs Dunne came to the attention of the Home Office through her high-profile Mothers Against Knives campaign, launched in July last year after her son Robert, 31, was stabbed to death with a Samurai sword. She, along with Middlesbrough councillor Joan McTigue, has been fighting to ban bladed weapons from sale. Mrs Dunne,said: "I had to read the letter a few times before I realised what the Home Office was asking. "They want me to suggest other weapons to go on the list. It makes it feel like the campaign has been worthwhile. I accept that you can't ban all knives but it will lessen the chances of weapons falling into the wrong hands. "Many weapons currently on sale have no legitimate purpose in society and if I can help get them banned it will be a victory. "I'm very proud of what I have achieved so far." Among weapons Barbara wants to see banned from sale are machetes, hunting knives, combat knives and replica and ornamental Samurai swords. Cllr McTigue has helped Mrs Dunne take her campaign to Downing Street where they handed in a petition with thousands of signatures supporting their battle. She said: "I'm delighted for Barbara. We have both worked hard on this campaign but it has been more difficult for Barbara because every time she talks about knives it brings home to her what happened to Robert." Robert, whose son Liam now lives with Mrs Dunne, was stabbed in the back with a Samurai sword in West Lane, Middlesbrough, in January 2003. Since 2000, the number of knife attacks on the streets of Teesside alone has almost tripled from 158 to 453 last year. The news comes amid a five-week national knife amnesty. Police stations across the country are opening their doors to anyone who wants to hand in a knife or sword... no questions asked. This campaign follows pressure from among others, the Teesside based campaign group, Mothers Against Knives. Launched by Barbara Dunne whose son was killed in a samurai sword attack, the group campaign for such knife and sword amnesties. She says, “I wouldn't ask them, I would beg them to hand them in. The dangers are irreparable. 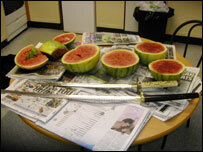 The BBC Radio Cleveland Breakfast team took two swords - a samurai sword they bought without any ID in a shop in Guisborough, and one that was used in an act of criminal damage in County Durham – and used them on some melons. 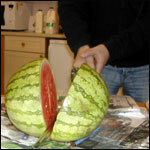 Neither is classed as a deadly weapon, because they're not sharpened ... So you don't need a license to own one.